Time has passed since my last product empties post and since then, I have managed to use up more products and collect more empty packaging. For some reason, looking at the products I have used up gives me a sense of satisfaction, like "Yeah, I actually got through to the end without changing a product!". It may sound like an easy feat for some to stick to using the same product; but as a huge beauty lover with an inclination towards constantly buying new products, trying them out and moving on to a new product halfway, finishing a product is a rare achievement. 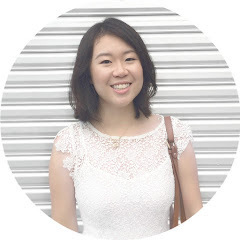 I actually had a few empties back in Malaysia when I went back last summer but forgot to photograph them so I couldn't write about them by the time I got back here. I've amassed quite a lot since I got back here so I'll talk about these instead. This shampoo and conditioner duo has a lovely floral with a hint of honey scent which makes it a joy to sniff in the shower- hee! I especially like the conditioner as it helps soften my hair after a wash with the shampoo. I've written a full review on these two so I won't go into much detail in this post. Check out that review HERE. I've pretty much never had things I disliked about Garnier lotions, and this was no exception. I like that it is dermatologically tested, that it claims to be suitable for sensitive skin and that it is colourant free. It definitely lived up to the 'suitable for sensitive skin' claim because I did not experience any adverse effects when using this. I also like the texture of this lotion. It is slightly watery and slippery, and does take a little longer to be absorbed into the skin, but once it is absorbed it leaves my skin feeling supple and soft. I used this during winter here and it helped protect my dry skin from the harsh elements. The scent is also divine - a milky scent (think Johnson & Johnson's Baby Milk lotion but a tad more subdued) with a sweet mango scent - it is calming yet refreshing. I purchased this on a whim. I had previously tried the same body lotion, except that it was Fragrance-free, and loved that, so I thought I'd try one with a fragrance. The texture of this lotion is beautiful. It is non-sticky, non-greasy, has lotion consistency which is not too thick nor runny, and leaves my skin feeling very soft and smooth. It is also dermatologically tested and did not cause my skin any irritation. My only problem with this product is the scent. If you like the scent of cherries and almonds combined, you will like this. I however, found the scent overpowering and cloying. I like sweet scents, but I think it was the strong almond scent in this product that rather turned me off. Combine that with an equall strong cherry scent, and it was overkill for me. But otherwise, this is a lovely product. I'll probably just stick to purchasing the Fragrance-free version next time. When this says 'gentle', it really is gentle alright. This soap-free cleanser claims to be suitable for all skin types including the most sensitive skin, is non-comodegenic, and can be used with or without water. I personally use this with water and I like how it left my skin feeling clean without leaving it feeling dry and tight and stripping it of its natural oils. This was one of the cleansers I used to help calm down the crazy outbreak of acne I had not too long ago and it did help clear up my skin. I do know people with oily skin who have used this and they disliked it though, saying it left their face feeling not as clean as they would like it to be, and slightly greasy. So I guess it really boils down to the individual using this product, but I can certainly say that I like this and that it helped soothe my acne-inflamed skin. A two-in-one facial product? How cool is that?! I was intrigued by the fact that this cleanser also doubled up as a face mask, so I purchased it to give it a go. It claims to help maintain clear skin, but I did not think it helped my skin. I was using this when my face was in its acne outbreak recently and I do not think it helped to reduce or clear pimples at all. I cannot say whether it caused more pimples though because almost everything I was using at that time did not seem to work. It has a cream-clay texture and does help leave the skin feeling clean, although at times it did leave my skin feeling slightly tight and dry. I tried using this as a face mask on my dry face and it stung, so I tried it on my wet face and it was fine. This may or may not be more suitable for those with more oily skin, but it did not work for me and I won't be repurchasing. This is a simple, fuss-free toner which I think would be suitable for all skin types. I like that it does not have a fragrance, it did not cause my skin any irritation or breakouts, and it pretty much did its job of toning and prepping my skin for serum and moisturiser. It leaves my skin feeling cool and refreshed after I use it and I sometimes like to spray this as a mist to refresh my face throughout the day. Nothing much to say about it other than the fact that it is a product which pretty much does the job it is supposed to do. Tea tree oil - a staple for acne-prone skin. I have been using this for years and have even featured it in my June 2012 favourites a while back. This helps to zap spots, leave them looking smaller the next day, and does not cause irritation or further breakouts. The only thing I find after having used it for so many years (I think I must have gone through 10 bottles by now) is that the effects of this little baby is not as effective as it once was - probably because my skin has gotten used to it. So I have stopped using it for a while and gone on to try other pimple-zapping products. But I will eventually come back to this again and would definitely recommend if you are looking for a spot-fighting product. 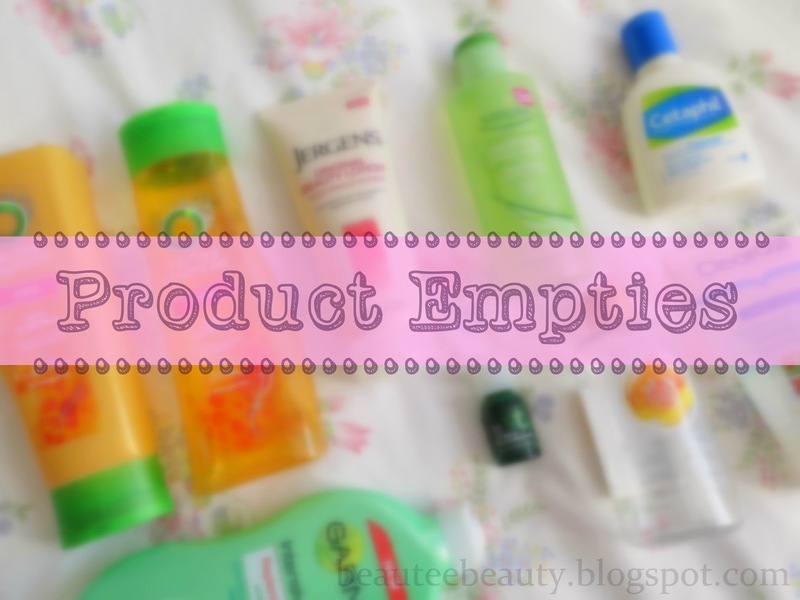 So those are my product empties! I'm very happy that I can finally recycle these bottles because I have been hanging on to them in order to write this post haha!